At Prestige Oral Surgery we utilize 3D Cone Beam CT Scanning Technology for our treatment planning. 3D Cone Beam technology provides highly accurate 3D radiographic images for the diagnosis, planning and treatment of oral surgery problems. Our patients can view their scan along with Dr. Erakat, allowing them to better understand their diagnosis, treatment plan, and expected outcome, all in one convenient visit. Three dimensional images enable a level of anatomical accuracy and patient care not possible with 2-D technologies. 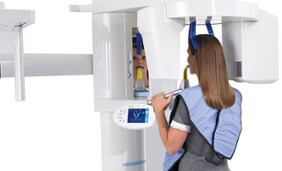 3D Cone Beam CT Scan can allow us to know precisely where to place your dental implant. Not 99 percent sure, but completely positive that the angle, rotation, depth, width and height of both the implant and the restoration will fit so well within your mouth it will be indistinguishable from the rest of your teeth. With 3D Cone Beam technology, patients with impacted teeth will benefit from less surgical uncertainty than when diagnosed with two-dimensional periapical or panoramic radiographs. We now can locate the impacted tooth precisely in 3 dimensions. This reduces surgery and anesthesia time, which translates into smoother and more pain-free recoveries. With 3D Cone Beam CT Scan in our office, our practice is committed to providing innovative, high-quality, patient care. In addition, this technology is convenient since it is done in our office, taking only minutes, and is extremely cost effective. To learn more about 3D Cone Beam CT Scan contact Prestige Oral Surgery today at (732) 297-7000.